The K-Club, a unique private network for entrepreneurs, hosted the second of its bi-monthly breakfast events at Liverpool Innovation Park this month. 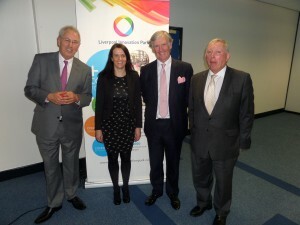 Over 50 members attended the breakfast event which saw guest speakers Nick Wainwright, Chairman of Liverpool-based jewellery giant Boodles and Cliff Maylor, CEO of the North West Fund address the audience. Nick Wainwright sparkled, giving an intimate insight into one of Liverpool’s most famous family-run businesses, which can trace its history in the city back to 1798. He spoke about how the company has weathered the recession and what has made it so successful, leading to them being ranked 11th in the Sunday Times International Track 200 list. Cliff Maylor spoke about the various funding streams that are available to local businesses from the North West Fund and how they can apply for funding as ‘40% must be spent in Merseyside before 2015. K-Club was set up as a unique private network that is exclusive to entrepreneurs and business leaders who have proven track records of achievement in developing some of the North West’s leading companies and corporate brands.